I have decided not to compete in an autumn Marathon this year. 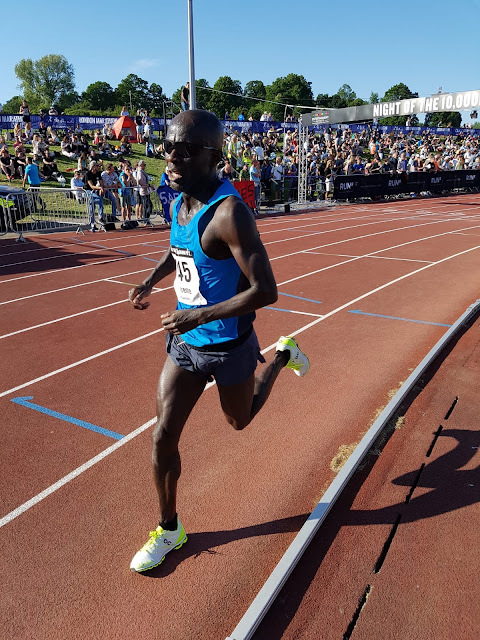 As much as I had enjoyed the build up to the London Marathon and the race itself, I felt it was time to focus on some shorter, faster races. London was my 6th Marathon in 30 months; should I return to the marathon next year, I'm hoping I will see the benefit of this alternative focus. 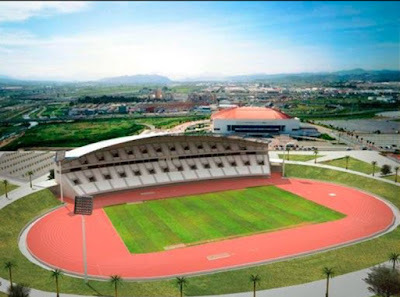 My main focus will be World Masters Athletics Championships to be held in Malaga, Spain in early September. This will be the 2nd time I have competed in these Championships. 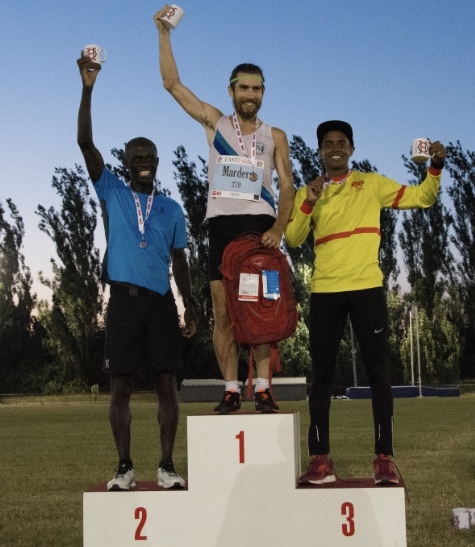 Previously in Lyon, France in 2015, I won the 10,000m in a time of 30:52.09. I managed to lap all the competitors except the silver medalist. This year there is no track 10,000m event on the track. This has now been moved to the road. Wishing to stay on the track I have decided to compete at the 5000m instead. Detailed below are the races I have competed in so far, with more to follow before travelling to Malaga. 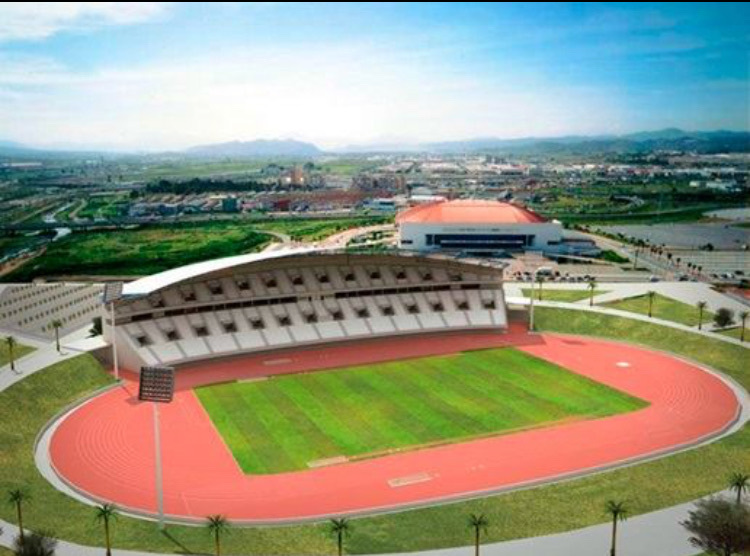 1 of 4 track facilities being used in Malaga, where over 8000 competitors are expected to compete. 6 June 2018. Rosenheim League Division East - Wimbledon. 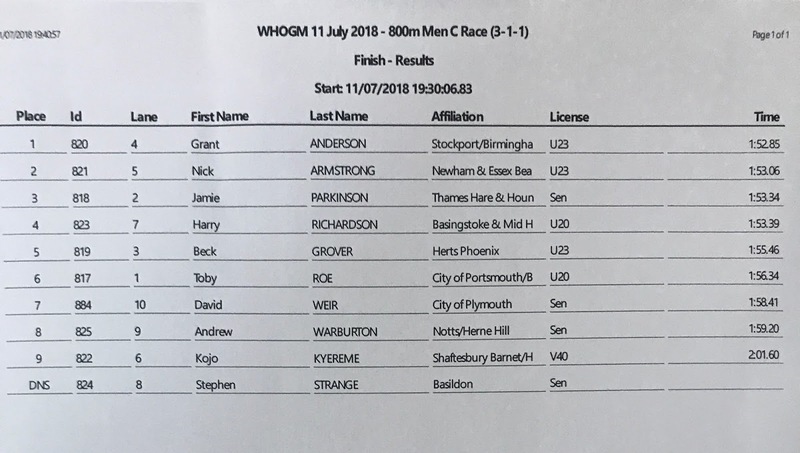 Following on from a 5000m and 10,000m race in May, I decided for the first time since 2013 to compete in shorter track races. I chose the local midweek Rosenheim League, competing for my second claim club Herne Hill Harriers. I decided to make an evening of it and subject myself to several races in a short period. So I entered the 800m, 1500m and 3000m. I set myself targets of sub2, 4 and 9 minutes respectively. 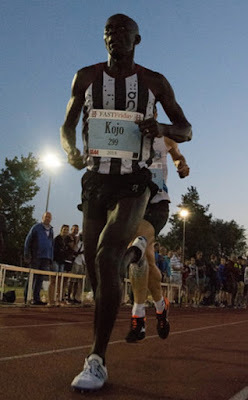 Beginning with the 800m I found the early pace, especially in the opening 150m, a shock to the system. 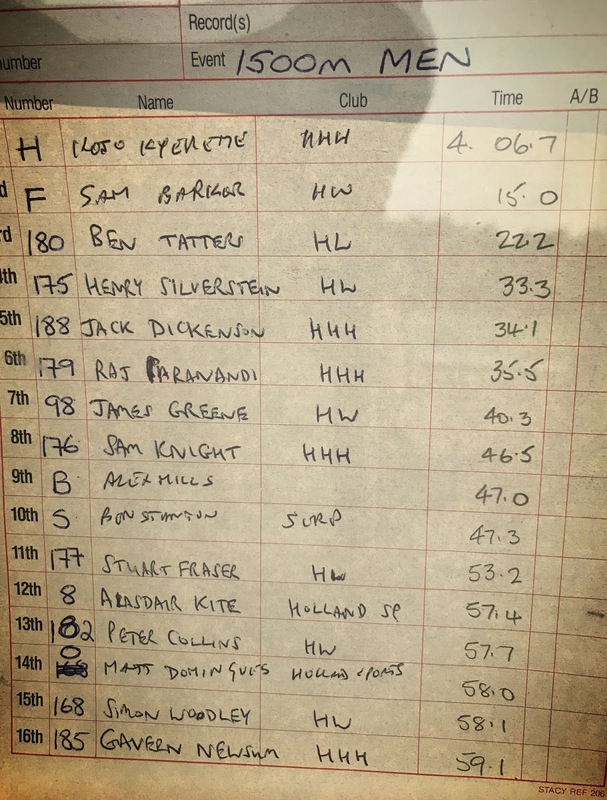 I was losing ground already on the leading athlete Jack Collins from Hercules Wimbledon. I made a concerted effort to narrow the gap but didn’t really make a dent in the lead, in fact I had lost more ground. Collins went through the bell in 56/57 secs to my 59/60. metres to go my momentum carried me past Collins as I dipped for the line taking the win in 1:59.7 just 0.2 secs ahead of Collins. Approximately 1 hour later I toed the line for the 1500m. Feeling somewhat hypoglycaemic but not afraid to stamp my authority, I took on the race by the scruff of the neck and accelerated off the start line into the lead. Only 1 athlete followed me through the first lap which was completed in 63 secs. Soon after I was on my own, running free and under no pressure to run any faster. 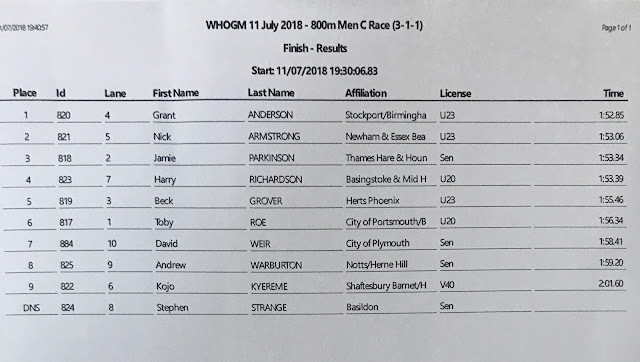 Through to the bell I had decelerated but picked things up running around 63/64 secs on the last lap finishing in 4:06.7 for my second win of the night. Less than half an hour later I was reluctantly on the starting line again for the 3000m. Like the 1500m I shot straight to the front and set out running laps in 71-72 secs. Two athletes, training partner Tom Higgs and former 2 time Olympian Paskar Owor, followed me lap after lap through the race. Leading into the bell Tom made his move and took over the lead. Anticipating an immediate response from Paskar I prepared myself to react. When the reaction didn’t come I kicked very hard with 350m to go. Upon reaching 200m to go I felt drained and didn’t have much left to give. I was passed by Paskar with 150m remaining, I had no response. After a short recovery I rallied one last time with 60m left. In response the crowd responded with cheers which alerted Paskar to the danger. He mounted an immediate response holding me off with comfort. At this point I grimessed with pain and took my foot off the gas shortly before crossing the line in 8:48.4. So 2 wins, 1 second place, 2 of 3 targets met. Not a bad nights work. 20th June 2018. BMC Regional Races - Eltham. felt confident of a good performance. First up was the 800m. The field was large with some lanes having two runners in them, mine included. I wasn’t particularly quick off the mark, rather preferring to ease my way round the bend without fighting for what little space there was in the lane. The opening 150 felt much easier than in the previous race. Clearly the focus on speedwork in training recently is showing. Approaching 200m I found myself getting boxed in and I had to chop my stride several times so not to trip any runners in front of me. In doing so I lost some momentum and the leading runners were gaining distance away from me. 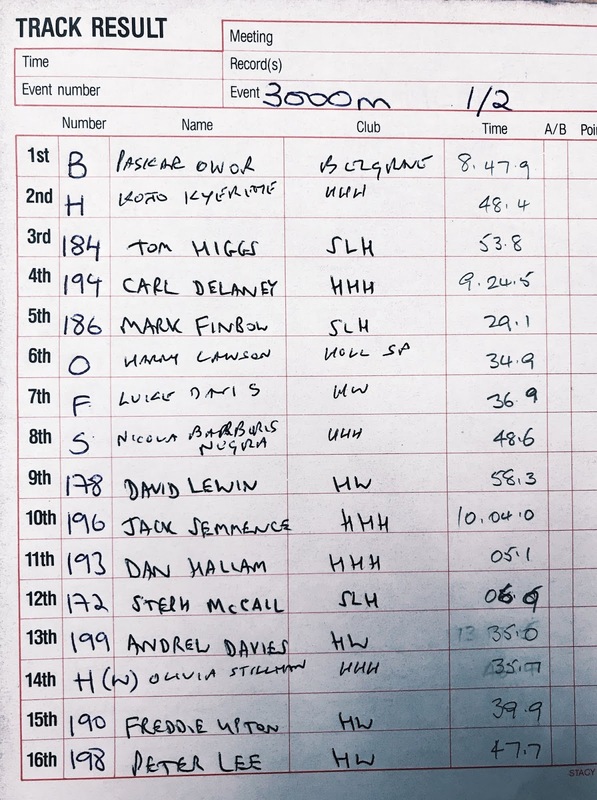 In 9th position, I passed the bell in 59 secs, which was slower than what I had hoped for. As I entered the back straight at 500m, the field was strung out. I was a good 30 m back at this point. Knowing this was my strong part of the race I increased my cadence and began closing down on the leaders. Although by 600m, I had only moved up one position to 8th. I went up another gear and pushed hard round the bend entering the home straight in 5th. With one last gear to work with I made my all out sprint for home closing down on the runners. In doing so I moved from 5th to 2nd before running out of track finishing in a seasons best of 1:58.23. I had been in doubt all along whether I would race the 1500m. But following a mile of easy recovery running I managed to bring myself, albeit half heartedly to the start line. It would have been easy to rest on my laurels and sit this one out. After all I had just ran a seasons best. The starting pistol fired I began reservedly, again positioning myself at the back of the field. The first lap was 64, 2:11/2:12 and 800m and 3:01 at the bell. I was dead last at the bell of a field of 15 athletes. I had lost complete contact with the race and it must have appeared to those spectating particularly those who knew I had raced earlier, that I was fatigued. Not wanting to settle for last place I began my charge for home at the bell. Slightly leaning forward I accelerated round the bottom bend and back straight. By 200m to go I was now in 11th gaining on the mass of runners in front of me. Running round the top bend I felt like I was flying. Coming into the home straight I was now in 8th. Working now at my very limit I pumped my arms as much as I could hoping that my legs would follow. I had to move out into lane 3 to get a clear run for the finishing line. Still passing people the line drew closer finally crossing in 5th position. 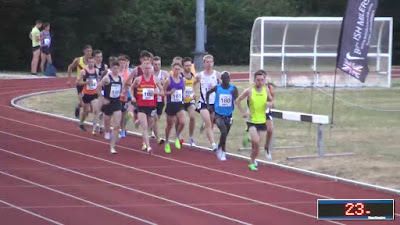 Orion Harriers Fast Friday 10,000m Open (inc. South of England Championships) Walthamstow. FASTFriday saw my 2nd 10,000m track race this summer. Incorporated was the South of England Championships. The hope was to regain the title I won in 2004 in a time of 30:20.90. From the gun I shot into the lead and eventually settled behind the pacemaker Robel Bahelbi who took us through the opening 4 laps. Aaron Scott shot to the front in order to maintain the pace at 72 secs per lap. This was short lived before the pacemaker resumed his duties and carried on before eventually dropping out at 4km. I took up the pace at this point then eventually shared the pacing duties with Paul Martelletti. By 5km we were on our own taking 2 or 3 laps of pacing each, this continued until approximately 1km to go when Paul made his move and opened up a gap large enough to prevent me reeling him in on my last lap sprint. Despite not winning I was delighted to have raced well in warm conditions finishing 2nd in 30mins 35.3secs to Martelletti's 30mins 32.4secs. 3rd place was the barefooted Belal Ahmed finishing in 30mins 48.3secs. 20th June 2018. 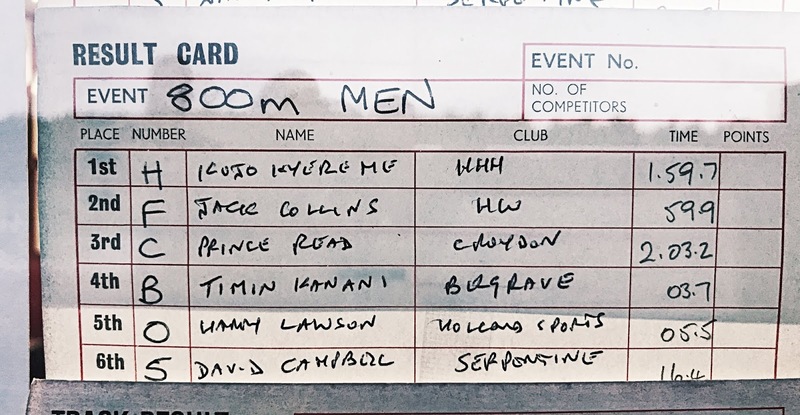 3000m BMC Grand Prix - Eltham. I committed to the early pace settling into 2nd position behind the pacemaker Tom Marshall and Jake Smith of Cardiff. The pace was set at 66 secs per lap. By 800m 2:16, and still in 2nd place I was 10 meters off the pace and isolated on my own with the chasing pack 15 meters behind. I passed through 1000m in 2:46, 1200m at 3:20 and 1500m in 4:10. The pacemaker stepped off the track at 1600m as Smith powered on. Still isolated, my cadence reduced and I was now experiencing the effects of the early pace. I was eventually caught in the straight as we approached 3 laps to go, and got swallowed up by the chasing pack. I tried in very hard to fight and hang on to the group. With 800 meters to go I was towards the rear of the chasing pack with another 7 athletes in arrears. At the bell I tried to produce a quick last lap but the legs were completely spent by the time I reached 200m to go. I eventually finished 10th place of 17, in a time of 8:30.24. However, it was a seasons best by 18 secs, and at the time ranked me top of the UK M40 rankings, subsequently being relegated to 2nd by Alastair Watson who has recently ran 8:29:17. Watford BMC Gold Standard Meeting. 11th July 2018. 800m BMC Gold Standard Races - Watford. It was unfortunate due to travel delays that I arrived late for this race. England were playing Croatia in the World Cup Semi-Final and I arrived just after England had scored an early goal. I registered and learnt I was in the first race which was due to start in 20 minutes. Without panicking I promptly put my numbers on my running vest and commenced a rather up tempo but short warm up of just a mile. Too short really to be of great benefit. I managed a few key stretches and a short 30m stride before getting to the start line. I started positively working the first bend hard before being passed on the inside. As we broke out of lanes I found myself once again towards the rear of the pack. I just didn’t seem to have it in me to keep close order. Coming towards the bell, gaps were appearing as the pack was now stretched out. I was now 5 metres off the rear of the pack and passed the bell in 58 secs. I didn't feel in control but tried nonetheless to make up the deficit. However, no matter how hard I tried I just couldn't get out of the current gear. I dug deep once again at 200m to go and once again with 100m to go, on both occasions without making any impression the race. I was falling further behind anxiously looking at the finishing clock I could see the race had been won in 1:52. I had hopes of breaking 2 mins but with the poor prep this never happened. I finished in 2:01.60. 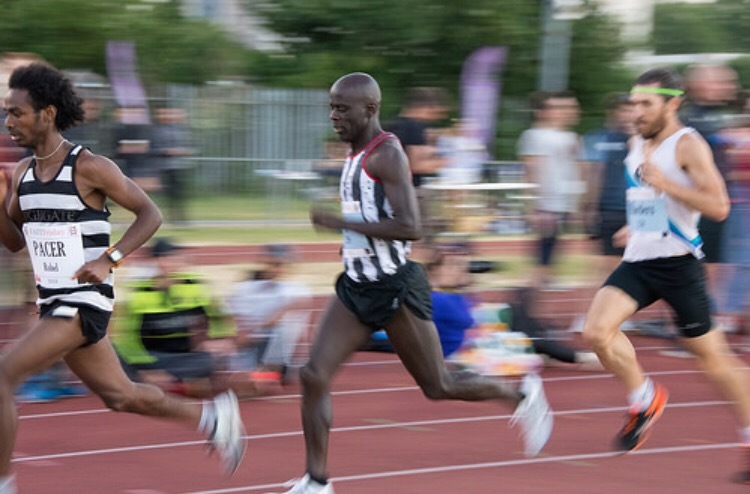 Instead of spending time with my family watching the football, I chose to race and clearly annoyed that I was unable to make the most of opportunity, I swore as I crossed the line which I subsequently got told off for by an official. Oops! Great read Kojo, impressive work on the track. I'm looking forward to Malaga. Good luck with your training Kojo, not long to go. Looking forward to a Papa John's pizza. Thanks Rob! Looking forward to Malaga too. Black olives, mushrooms and green peppers as per usual please! !